« Oracle Database 11g Direct NFS + Real Application Clusters + VMware vSphere + Fully Automated Storage Tiering? Yes! Of Course! Oracle Database Appliance–Bringing Exadata To The Masses. And, No More Patching! 1. Exadata is not an appliance. 2. Oracle Database Appliance has no Exadata software in it. In this Computerworld article, Mark Hurd is quoted as saying the Oracle Database Appliance brings “the benefits of Exadata to entry-level systems.” So, I googled ‘this brings the benefits of Exadata to entry level systems’ and was offered 36,300 nuggets of wisdom to read. I have only one thing to say about this big news. There is a huge difference between a pre-configured system and an appliance. I’ve never had to apply a patch to my toaster. The Oracle Database Appliance is not an appliance, it is a pre-configured Real Application Clusters system. SMB (Small/Medium Business) + Real Application Clusters? Who is handing out the get out of jail free cards? Who briefed Oracle’s Executives on what this thing actually is before they started talking about it? Exadata and Oracle Database Appliance are pre-configured, yes, so perhaps that is what Mark Hurd means when he said “the benefits of Exadata.” If that is the case, I agree. Pre-configured Oracle software is a *huge* benefit because it is very complex. You are very right to point out that this new database appliance does not contain any Exadata software, but about the appliance / preconfigured system difference, do you know any IT appliance that does not require patching or updates? Now, what I’m curious about is how this thing will hold up with write intensive databases (OLTP or DWH) when you have 24 disks and asm 3 way-mirroring. You’re right. All software needs maintenance. There are updates and then there are patches. Appliances should not be comprised of software that needs *constant* patching. I’ve upgraded software on appliances before (netapp) and it is really simple. Patches too. Once an “appliance” requires dozens of manual steps to patch the software I feel it becomes unworthy of the title appliance. It’s about patch frequency and patch application procedure difficulty. I concur that patch simplicity needs to be a criteria for asserting that a pre-configured system is an appliance. I’m not sure about patch frequency though. By my definition, an appliance would have a single software image that includes all necessary components, and any patches would be an up-rev of a minor version number and re-install of that single image. If under the covers that single image was assembled from bits and pieces, that should be transparent to me as a administrator of that appliance. I agree Michael. My bit about frequency is only due to the compounding effect of the complexity of RAC patching procedures. If it is a simple process then patch frequency wouldn’t in itself be a problem but I also think that something that needs *constant* patching is begging for a good, long reconsideration. Is constant patching a sign of vendor responsiveness or a sign of fundamental product problems? Uh, I think the answer to that question is yes!. You get 20 disks with 3-way mirroring. The IOPS rate you attain in such an environment is hard to predict as it would depend hugely on the read:write ratio. In short I would not expect balance between 20 spindles and 24 Westmere-EP cores for traditional OLTP-style I/O patterns. Less than a single spindle per core is awfully light for such a workload. But, as I said, the Oracle Database Appliance IOPS capability could be just fine for a lot of workloads. Your mileage will vary. Exadata-mini might be a better start for those who don’t have million$ to spend but still want some Exadata feature, but definitely not the Oracle Database Appliance (ODA). The only attractive feature for the ODA is ‘pay-as-you-grow’, but not sure how well it is when you only pay for 2 cores license per machine. I am expecting Oracle can show some benchmark stats for the ODA. Don’t expect any industry standard benchmark for Oracle Database Appliance. You wouldn’t need any such benchmark. It will run Oracle just as well as any configuration with 24 Westmere-EP cores attached to 20 spindles with 3-way mirroring. No magic. And SSD for redo at that scale is not needed. I suppose it was put in there to ensure they’d never run into any redo edge-case (e.g., absurd redo due to some application inefficiencies). How do you think about it(ODA)? It uses 2 internal 1GB Ethernet (GbE) ports (eth0, eth1) for the private interconnect. No exadata software and uses flash disk for redo log. I think it will run Oracle just fine. I also think the main value props are 1) the pay-as-you go bit because Oracle licensing is dizzying beyond human comprehension and 2) the pre-loading of the software because the software is complex beyond mere-mortal capability (at least RAC is). If you already have storage and are Oracle savvy then I think buying a couple of pizza boxes from which ever vendor you buy all your servers for file/print, web, exchange would do just fine though. 20 disks is 20 disks. No magic. How did I know the bull about “no need for a dedicated dba” would accompany this announcement? Yeah, right: like, a dedicated or otherwise dba has EVER been involved in managing the storage layer hardware/software, other than in the dreams of this idiotic and ignorant “spokeswoman”? Have these people EVER entered an IT installation? I work as a consultant and for many installations I also need to install the os (linux), configure the network on it and map the luns on the server. When they are using NetApp, I often also create the luns myself and initiator groups (which is, in case of NetApp, not very difficult). And often this is for me easier then explaining to a system admin which packages I need or how the storage should be created. Now, the question of this new db appliance (or preconfigurated box) removes the need for a dedicated DBA, is an entirely different one. Well, if you work as a consultant for many clients, then you are NOT a DBA working at a client. So, like I said: in client sites DBAs don’t take care of the OS, the SAN and the network AS WELL as the database. They never did and to cl;aim they do is FALSE and MISLEADING. It would likely be worth your time to READ what I wrote, understand it and reply in context? Do you think that design would be worth thinking about ? No, I don’t think a SPARC variant is interesting. I think SPARC needs to die sooner rather than later (which it will). Why delay the pain…the more reliant IT shops become the more painful the eventual death will be. It will happen. Solaris x64 should live on I think. These are my opinions. OK understood for the SPARC variant. I agree that TI built slow CPUs, and even though TSMC now provides faster CPUs for Oracle, they have lost a tremendous amount of market shares. May be that T4 will slow down the decline or even boost again the SPARC story ??? – what about F20 usage for REDOs & Smart Flash Cache ? – why didn’t they implement their optimized Linux kernel into ODA ? I do not think the Smart Flash Cache you refer to is worth the powder it takes to blow it up. Database Smart Flash Cache is a lark. We are no longer in a world of constrained (relative) RAM world. If you do not max out DRAM *before* fiddling with that Database Smart Flash Cache you are *not* doing diligence. If you max out DRAM (which for this system we are discussing is 144GB) and maximize the SGA to fit before experimenting with Database Smart Flash Cache you are taking the wrong approach. I have no idea why the UEK is not in the mix. Makes little sense to me. Maybe that is a way to force you to a quarter-rack Exadata? 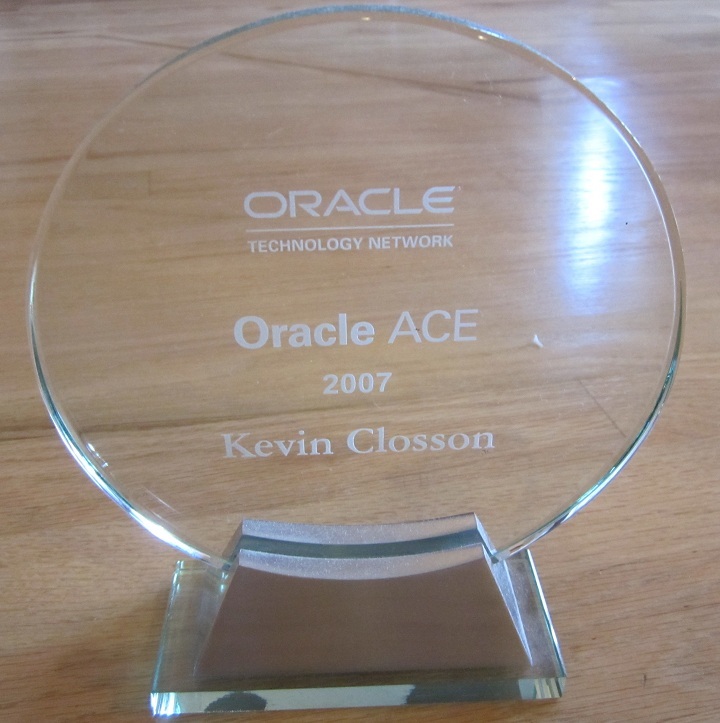 I have been reading your blog ever since I meet you at a Oracle user group many years ago when HP had just bought PolyServe. I have enjoyed your straight talk and you have been pretty fair in your posts. With your move to EMC your blog has taken a more pro EMC position which is expected. But after reading this post it sounds like its coming from the vice president of marketing at EMC. I agree with you on #2 ODA has no Exadata software. Before classifying Oracle Database Appliance as a pre-configured system vs an appliance a definition of the two is required. I am glad you somewhat provided one in your comments but a stating in a actual post would be better. If the Oracle Database Appliance is a pre-configured system acorrding to your definition when EMC Greenplum Computing Appliance also is a pre-configured and is misnamed. Greenplum also requires *constant* patching or upgrading. I am no expert on Greenplum but release notes for 4.0.4 was updated on December 9 2010. There are 3 patchsets for 4.0.4 for it and 7 issues outstanding as of 4.0.4.3. On March 7 20011 4.0.5.0 was released and it has 3 outstanding issues. Is Oracle perfect? No, its far from. But if Exadata and ODA are pre-configured system then Greenplum Computing Appliance is a pre-configured system and probably Netezza and Teradata as well. Please continue to expose the flaws and marking fluff Oracle puts out but don’t limit your reviews or half truths to Oracle. Thanks again for your great blog and do agree with you. The sooner SPARC dies and probably Solaris too the better. My post about the SuperCluster will (fingers crossed) be the last of my technocratic posts for a while. I do consider the EMC Data Computing Appliance to be more of a pre-configured system than an appliance. I suppose not pointing that out looks like a half-truth. I should have been more sensitive to that fact. You are certainly fair, and correct, for pointing that out! Having said that, it will become more appliance-like over time (you knew I was going to say that). I suppose the Oracle Database Appliance could be expected to become more appliance-like over time, but I don’t think anything running Oracle cluster database software will ever be able to gain appliance status. The software is just too complex. Oracle database is fantastically powerful and feature-rich. But maintaining that software is just too difficult for any mere mortal and achieving a real appliance state is likely out of reach. When someone speaks of a little one-man-lift, 4U device marketed as an appliance for SMB I think customers actually expect it to be just that–an appliance. The Appliance Manager software in the Oracle Database Appliance is claimed to support “patching the entire appliance, including all firmware and software, in one operation, using an Oracle-tested patch engineered specifically for the appliance.” If that claim proves true then I think the Oracle Database Appliance will fill a significant need in the Oracle customer base. I’d even go as far as to say that a good percentage of Exadata Quarter-rack deployments would do just fine on the Oracle Database Appliance for OLTP-like and ERP workloads where Exadata Smart Scan isn’t a real benefit! On the other hand, at 42U, ~14KW and multiple racks to boot, customers hear the word appliance from the high-end DW/BI vendors and sort of set their expectations accordingly–I think. Maybe everyone hears the word appliance in the IT context and rolls their eyes. I think Netapp and EMC VNX are appliances. I don’t roll my eyes in those cases. I suppose I should have just stressed the point that there is no Exadata in the Oracle Database Appliance and left it at that. I’m pro-Open Systems and pro-Best of Breed. I’m just a firm believer in fair play and the notion that competition in the marketplace is the best thing for customers–most particularly IT. I don’t slam EMC’s competetion (e.g., Netapp). Doing so would make me a mere mouthpiece or extension of EMC marketing and that isn’t what I’m about. I don’t think Solaris should die. Solaris solves problems and the x64 Solaris offering is a high-quality Operating System. SPARC, on the other hand, just delays a problem–the eventual migration to a viable platform when SPARC is truly, really dead as opposed to a sort of zombie status. I think SPARC customers are facing a difficult pay-now-or-pay-later scenario. I’m actually going to be on the phone with one such customer this week. “Paying now”, as it were, is usually less expensive than paying later. Some customers cannot take the risk or time to do the right thing to avoind paying later but that payment will come due. I simply cannot see Intel, Power and SPARC in the same business. Oracle spent all of the first decade of this century telling customers to migrate off of SPARC and onto clustered Linux (in spite of the fact that Oracle’s GSI ERP remained on SPARC throughout that time frame and is still SPARC today). Surely we’ve not forgotten the Linux RAC versus SMP tirades leading right up to about 1 minute *after* Oracle acquired Sun.